There is a vast body of evidence to show that residential treatment for addictions can enable people to lead drug-free lives. At Castle Craig we strive to provide the highest standard of treatment and the results show that our treatment is effective. Castle Craig has produced several outcome studies over a number of years and these have shown consistently good results. Our 2015 study used the Christo Inventory for Substance Misuse Services (CISS). This tool is a widely used outcomes tool in the UK. The questionnaire was sent to 233 patients admitted to Castle Craig between 2011-2012 for alcohol, drug and gambling addictions. The patients in this study were all from Holland. 75% of patients completed treatment, others prematurely self-discharged against medical advice, a small number were prematurely discharged for rule violations or on medical grounds. 91.8% of followed-up patients improved, 8% remained the same, none got worse. 73.4% were totally abstinent from all drugs or alcohol at follow-up. 81.6% achieved low problem severity at follow-up. Our study of cocaine-addicted patients, in 2007, also used the Christo Inventory for Substance Misuse Services (CISS). Our questionnaire was sent to 89 patients admitted between August 2002 and February 2004 for severe cocaine dependence, and yielded a 75% response rate. Good outcomes were achieved for these patients despite their high severity of dependence, their severe psychological and physical health problems, poor social functioning and previous attendance at numerous out-patient treatments. 66% of those who completed treatment at Castle Craig were totally abstinent from all drugs or alcohol at follow-up (after 3-5 years). 46% of those who completed detox (but not necessarily the full treatment programme) were totally abstinent on follow-up. 78% of those questioned achieved low-problem severity. 84% of those questioned showed a reduction in levels of dysfunction. Those patients who entered the Castle Craig extended care programme were significantly more likely to have a good outcome. The study found that even the treatment ‘failures’ i.e. 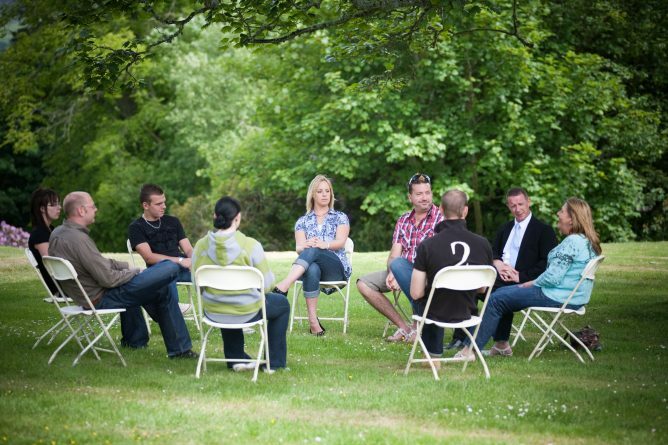 those who relapsed, still appeared to have benefited from their experience in treatment. “Castle Craig Hospital appears to be providing a service for very dysfunctional cocaine dependent people with complications from lack of support, poor health, psychological problems, and lack of occupation. In total 60% of clients were abstinent for at least 6 months prior to follow up. A study in 1999 investigated the results of 96 severely dependent patients who were admitted into the extended care programme after the first phase of treatment was complete. The results showed that 62% of those who completed treatment had remained abstinent for a minimum, of 3 months and up to a minimum of 420 days. Between July and December 2015, we surveyed 250 satisfaction questionnaires, which had been filled out by patients leaving treatment. 98% of patients graded their overall stay as good, very good or excellent. In 2009, Castle Craig surveyed 150 patients from primary stage care and the extended care facility. The overall satisfaction for the service ran at 87% in the Intensive Therapy Unit with the categories of ‘Nursing Care’, ‘Individual Counselling’, ‘Detoxification’, ‘Group Therapy’, and ‘Staff Attitude’ all scoring 90% or more. The Extended Care Unit scored 82% overall satisfaction level with Specialised Therapies Individual therapy, Group Therapy and Family Therapy all scoring 90% and above. The recommendations from the survey have since been used to further improve and strengthen those areas of service at Castle Craig.